The preservation of native wildflowers (forbs) is important for plant community function and diversity, and provides food and cover for wildlife. Field studies have been conducted throughout western states to determine the impact of herbicides applied to control invasive weeds on native plants. However, finding adequate native wildflower populations to evaluate their tolerance to herbicide applications is often difficult. A greenhouse study to evaluate the tolerance of nine native prairie wildflowers to Milestone herbicide was established at North Dakota State University. The species included in this study were representative of common native prairie plant families that could not be evaluated in field trials because of their rarity or tendency to grow singularly in the wild. The species chosen were harebell (Campanula rotundifolia L.), white prairie clover (Dalea candida Michx. ex Willd. ), purple coneflower [Echinacea purpurea (L.) Moench], blanket flower (Gaillardia aristata Pursh), closed bottle gentian (Gentiana andrewsii Griseb. ), great blue lobelia (Lobelia siphilitica L.), prairie coneflower [Ratibida columnifera (Nutt.) Woot. & Standl. ], showy goldenrod (Solidago speciosa Nutt. ), and azure aster (Symphyotrichum oolentangiensis Riddell). The prairie wildflowers used in the study were obtained from a commercial nursery and transplanted into conetainers filled with a commercial potting media and sandy loam soil. Plants were grown approximately 20 to 32 weeks in a greenhouse with temperature and lighting regulated to simulate field conditions and initiate flowering in wildflowers. Plants were treated with Milestone at the approximate growth stage found under field conditions for a fall application timing to control Canada thistle. Milestone at 1.75, 3.5, and 7 fluid ounces of product per acre (fl oz/A) was applied with an air-pressurized greenhouse cabinet-type sprayer. A non-ionic surfactant at 0.25% v/v was added to the herbicide solution to maximize potential wildflower injury and simulate a typical broadcast application in the field. Plants were visually evaluated for injury 1, 7, and 14 days after treatment. Following the 14-day rating, the top growth was removed and plants were allowed to regrow for 5 to 8 weeks. Visual percent injury was taken at 7 to 9 weeks after treatment (WAT) (Table 1). 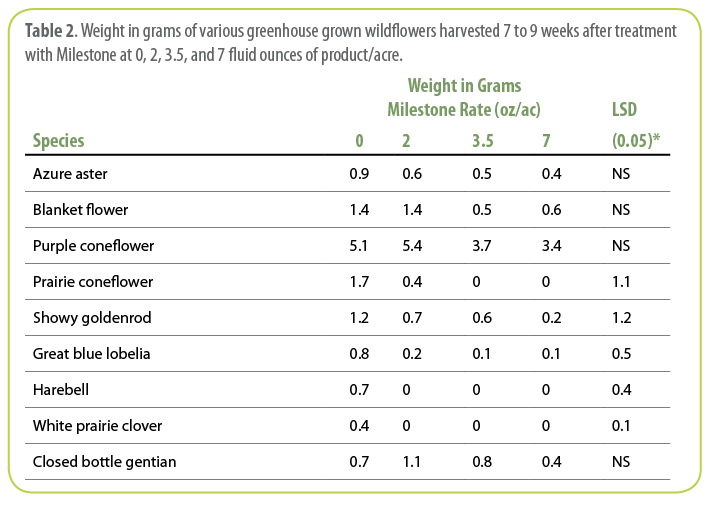 Plant regrowth was clipped following visual evaluations and weighed to estimate the long-term effect of Milestone® on plant production (Table 2). Prairie wildflower susceptibility to Milestone® varied by species. Purple coneflower, closed bottle gentian, and azure aster were tolerant to Milestone (Table 1) and quickly recovered from initial injury (if any). Although azure aster was tolerant to Milestone in this study, similar Asteraceae species have shown variable tolerance to fall-applied Milestone in the field (Almquist and Lym 2010, Samuel and Lym 2008). Closed bottle gentian was moderately tolerant to Milestone at 3.5 to 7 fl oz/A. Injury for this species tended to increase as the application rate of Milestone®increased (Table 2). Milestone will likely not adversely affect closed bottle gentian in the long-term. Blanket flower and showy goldenrod were moderately tolerant to Milestone. Field studies in prairie plant communities suggest that Milestone may cause injury to Solidago species. Milestone applied in the fall at 7 fl oz/A reduced foliar cover of Canada goldenrod (Solidago canadensis L.) and Missouri goldenrod (Solidago missouriensis Nutt.) 22 months after treatment in prairie plant communities in Minnesota (Almquist and Lym 2010) and North Dakota (Samuel and Lym 2008). Velvety goldenrod (Solidago mollis Bartl.) foliar cover was reduced by more than 75% compared to the untreated control 10 months after Milestone® was applied (Almquist and Lym 2010). These results suggest that these Solidago species were more sensitive to Milestone than showy goldenrod, or there had not been adequate time for plants to fully recover by 10 or 22 months after treatment. Although both blanket flower and showy goldenrod were slightly injured by herbicide treatments in the greenhouse study, plants would likely recover by the following growing season. Milestone severely injured or killed harebell, white prairie clover, great blue lobelia, and prairie coneflower when applied at rates as low as 1.75 fl oz/A. Similar results for prairie coneflower have been reported in earlier research when Milestone was applied in fall to a western North Dakota native plant community (Samuel and Lym 2008). Although Milestone caused severe injury to great blue lobelia, most plants were alive 7 WAT so the species may have been able to recover over time. In a Minnesota field study, palespike lobelia (Lobelia spicata Lam.) was injured, but not killed by Milestone® at 7 fl oz/A (Almquist and Lym 2010). Although foliar cover was reduced, Milestone did not eliminate palespike lobelia from the prairie plant community even when applied at the maximum use rate of 7 fl oz/A. Tolerant species such as purple coneflower (left) quickly recovered from initial injury, whereas prairie coneflower (right) was severely injured or killed by low rates of Milestone. This information is valuable to land managers who are tasked with balancing the benefits of a Milestone application to control invasive weeds with the potential of unintentional injury to desirable wildflower species. The results of this greenhouse study expand and support data from field studies on susceptibility of native wildflowers to Milestone applications. Wildflower species that were tolerant to Milestone in the greenhouse likely would be tolerant in the field. Additional information on plant tolerance to Milestone® application can be foundat http://techlinenews.com/ForbShrubTolerancetoMilestone.pdf. Almquist, Travis L. and Rodney G. Lym. 2010. Effect of Aminopyralid on Canada Thistle (Cirsium arvense) and the Native Plant Community in a Restored Tallgrass Prairie. Invasive Plant Science and Management: June-August, Vol. 3, No. 2, pp. 155-168. http://openagricola.nal.usda.gov/Record/IND44392657. Samuel, Luke W. and Rodney G. Lym. 2008. Aminopyralid Effects on Canada Thistle (Cirsium arvense) and Native Plant Species. Invasive Plant Science and Management: July 2008, Vol. 1, No. 3, pp. 265-278. http://dx.doi.org/10.1614/IPSM-07-049.1. Milestone is not registered for sale or use in all states. Contact your state pesticide regulatory agency to determine if a product is registered for sale or use in your state. When treating areas in and around roadside or utility rights-of-way that are or will be grazed, hayed or planted to forage, important label precautions apply regarding harvesting hay from treated sites, using manure from animals grazing on treated areas or rotating the treated area to sensitive crops. See the product label for details. State restrictions on the sale and use of Milestone apply. Consult the label before purchase or use for full details. Always read and follow label directions.